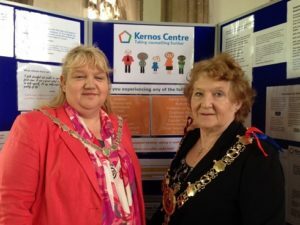 Sudbury’s new Mayor, Cllr Sue Ayers, has chosen Kernos as one of the three local charities that she will be lending her support to during her term of office. There will be various fund-raising events taking place during the coming year, all designed to help benefit the Mayor’s selected charities. After Cllr Ayers’ 12-month term of office comes to an end, the Kernos Centre will receive a share of the total funds that have been donated. In her inaugural speech the new Mayor (right, with the Deputy Mayor Cllr Sarah Page) paid tribute to the dozens of volunteers who help to run organisations and stage events in Sudbury. She added “I am really proud of Sudbury and the fact that it has so many things going on, and that’s largely down to volunteers”. At a time when locally-sourced, long-term financial support is proving particularly hard to find, the new Mayor’s support is good news for potential clients of Kernos, since every penny allocated to the Centre from the Mayor’s fund will go to help the provision of the professional counselling and support for local people suffering from emotional and psychological difficulties.